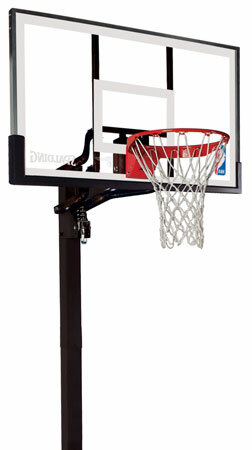 Offering a large selection of basketball goals, basketball equipment and basketball accessories! We offer free shipping and affordable prices! Call Us Toll-Free Today at 404-378-8775. You’ve found us! Your search for a company in the Atlanta area to help you get the perfect basketball system for you and your family has paid off. Need a new basketball system? Need it to be adjustable so the little ones can reach? Not sure what the difference is between one and another? Got an old basketball hoop that needs to be removed? Or maybe it just needs a new backboard? Which system will survive in our neighborhood recreation area? Call David at 404-378-8775. He has been installing basketball goals for 13 years. He knows every nut and bolt of every system available. His experience with the installations of all the different brands, dealing with the manufacturers and their warranty policies and general knowledge of how well certain basketball systems stand the test of time will make the decision process of which one to buy much easier. You’ve seen all the different systems available. Most even look the same. Spec-wise they may seem similar but you don’t want to find out it’s not the right one after you concrete it in the ground. because it will be the last one you will need to buy. Call David first. You definitely should call if you are considering a portable basketball goal and are looking to get the same quality play as an in-ground basketball goal. If you just want a “toy” for the kids than they are< great and are available at most department stores. There is a reason why we do not sell every basketball system available. We could like other companies but long ago we found it easier to sell the best systems at the best prices and install them correctly. If you have one already and want it installed, call David at 404-378-8775. Welcome to AtlantaHoops where we are constantly refining our inventory to make available the latest and best systems to you. You may have noticed searching the web for basketball systems that there is a lot to choose from. Some sites have them all! We are not just an on-line store that sells just anything our vendors offer. Instead, we pick and choose THE BEST and only carry systems that we have personally installed and are willing to put our name on. We are the best Atlanta Basketball Systems installation company and we know every bolt and screw on our systems and they were chosen because they are better then another. If two systems are equal in quality but not price, why offer the more expensive one? Ask one of those sites that has pages and pages of systems that all look the same which is the best for the money. Then ask them why they carry the others. Feel free to call us and ask us why a system you have seen elsewhere is not listed here. An installer will tell you exactly why we don't carry it and what we do carry instead, and why. We can sell them all, so if you want one not listed, we can get it for you at the same price as the other guys. With our high quality basketball hoops and basketball accessories, Atlanta Hoops is here to help you make the dream of having a your own professional basketball court a reality. Atlanta Hoops has been selling and installing high quality basketball goal systems since 1996. We are committed to providing outstanding customer service and making your shopping experience a pleasant one. We will always strive to offer only the best basketball goals. Our sales staff is knowledgeable and friendly and always ready to answer any of your questions about our inground basketball goals and our portable basketball hoops. We sell inground basketball goals, portable basketball goals, basketball goal accessories and even institutional basketball goals. 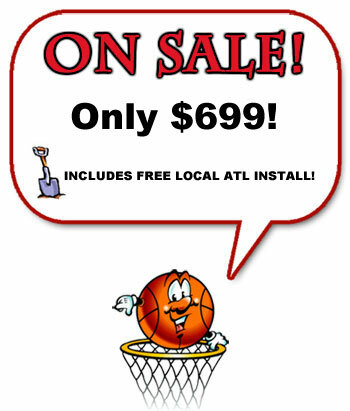 Atlanta Hoops also provides quality basketball goal installation to Metropolitan Atlanta customers. Atlanta Hoops installs inground basketball goals, adjustable basketball goals and portable basketball goals. We have installed many ingound and portable basketball goals around the Atlanta area over the years. We carry and install inexpensive inground and portable basketball goals that look great and are homeowner association approved. We also carry and install high end basketball hoops that will withstand ballers slamming and jamming for decades. We guarantee that our inground and portable basketball goals will look great and last for many years to come. When it comes to basketball equipment and basketball accessories, Atlanta Hoops is a great source for affordable basketball equipment and useful information!